The IBM® Virtualization Engine TS7700 provides tape virtualization for the System z® environment. As the follow-on product to the highly successful IBM TotalStorage® Virtual Tape Server, the TS7700 Virtualization Engine is designed to provide improved performance and capacity to help lower the total cost of ownership for tape processing. It introduces a new modular, scalable, high-performing architecture for mainframe tape virtualization. The TS7700 Virtualization Engine integrates the advanced performance, capacity, and data integrity design of the 3592 Tape Drives, industry-leading tape technology from IBM, with high-performance disk and a new advanced System p® server to form a storage hierarchy managed by robust storage management firmware with extensive self management capability. It includes functions such as advanced policy management to control physical volume pooling, cache management, dual copy, dual copy across a grid network, and copy mode control. The TS7700 offers a new standards-based management interface and enhanced statistical reporting, compared to the VTS. 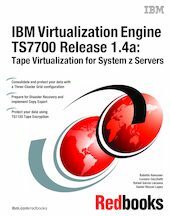 This IBM Redbooks® publication provides a detailed description of the TS7700 Virtualization Engine. In addition, it discusses the tasks involved with planning, implementing, and operating the TS7700 Virtualization Engine and describes migration considerations. This book covers the TS7700 Virtualization Engine releases up to and including TS7700 R1.4a and includes information about supported tape drives and libraries current and supported at the time of writing. For detailed information about the IBM Virtualization Engine TS7740 R1.5 and the disk-only TS7720 Virtualization, refer to IBM Virtualization Engine TS7740 R1.5 and TS7720: New Virtualization Options for Mainframe Servers, SG24-7712, which will be available in early 2009.